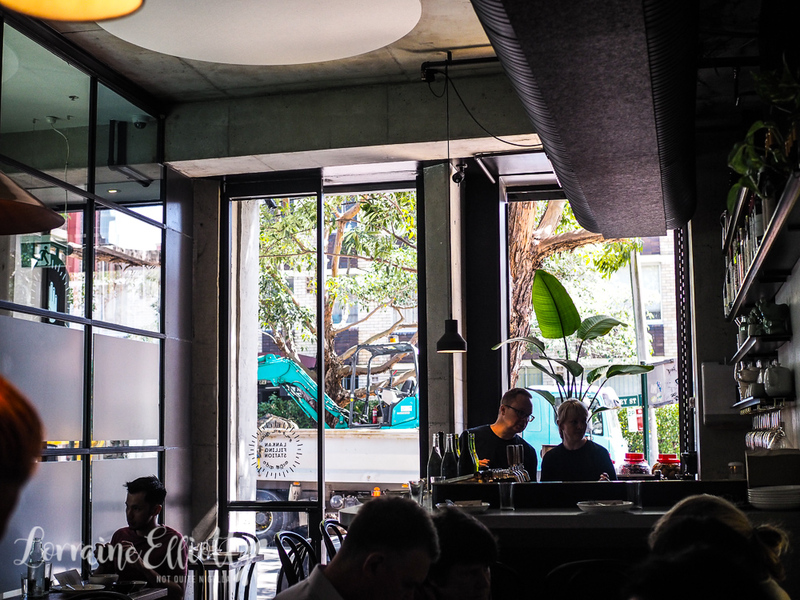 The new Sri Lankan eatery Lankan Filling Station is located on Riley Street in East Sydney. There you'll find a range of Sri Lankan goodies on offer. 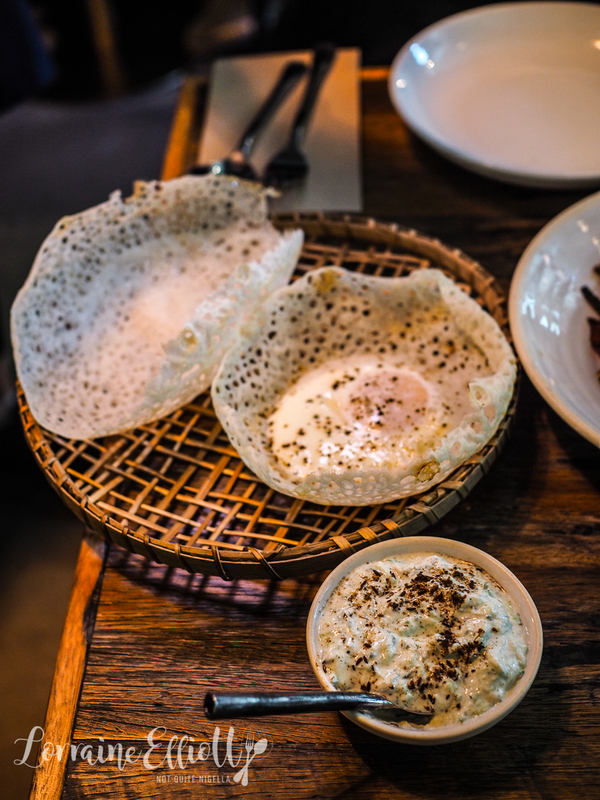 Start with egg hoppers or string hoppers and dip them into a curry, season with a sambol or snack. I arrive at Lankan Filling Station at 12:15pm on a Friday and easily nab a table. Girl Next Door arrives a few minutes later and come 1pm most tables will be taken with some room at the bar. 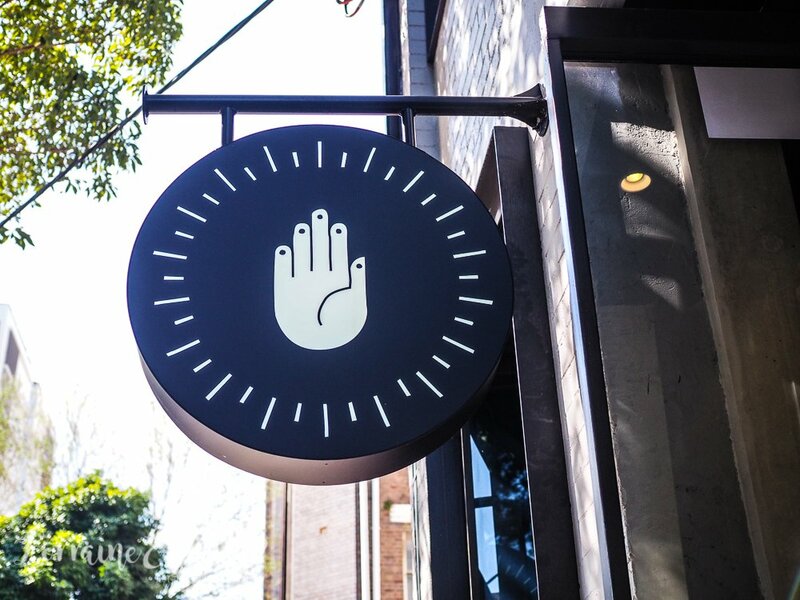 Lankan Filling Station is by chef O Tama Carey formerly of Berta who is in the kitchen. Service is really lovely and personable from the all female floor team. 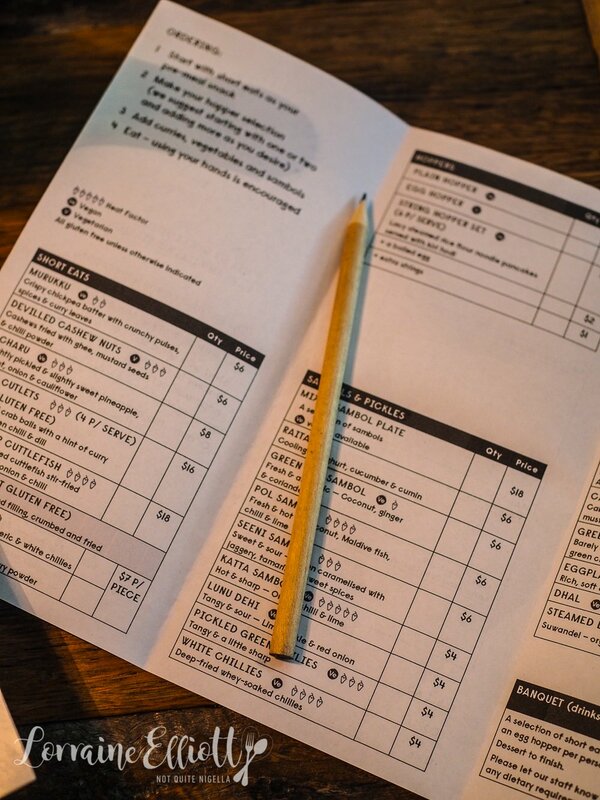 You can fill in the form with what you would like and they cross it off when it comes to the table or you can just give your order verbally. We start with some drinks. The drinks are either dry/unsweetened drinks or super sweet drinks like Falooda. 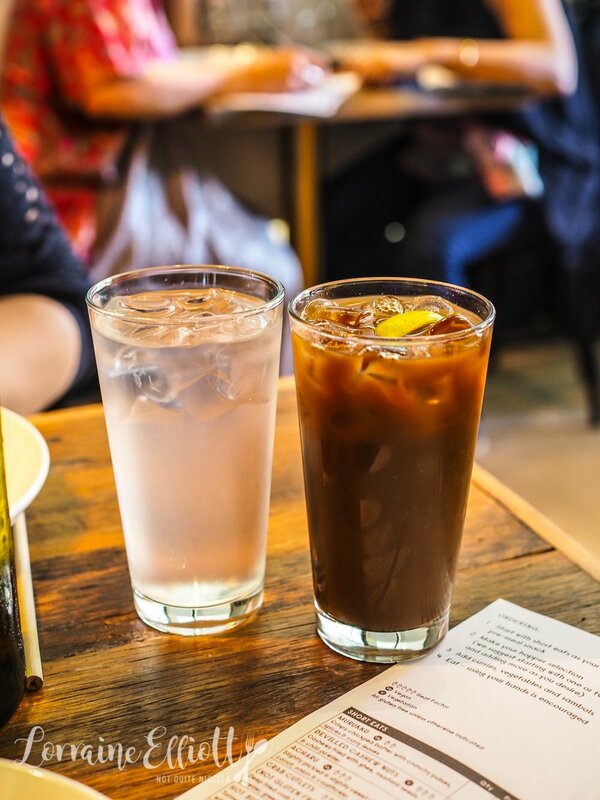 We order a King Coconut drink which is unlike the Thai coconuts in that it isn't sweet at all (although it perfectly counters the heat from the chilli) and a tamarind iced tea which is also unsweetened. Alas we're both not huge fans of the tamarind iced tea and it does seem a bit pricey too. "I told you not to order it," says Girl Next Door. The bowl shaped hoppers arrive piled high on a basket. The egg hopper is nice with a runny yolked egg in the centre with a crispy edge while the plain is the same base without the egg. They tell us that we can break it off and dip it into the curry. I almost wish we had stomach space to try a plain, egg and a string hoppers (the latter which you can order with extra strings). Hands down my favourite dish of the meal is the hot butter cuttlefish with tender cuttlefish and large, chunky vegetables. 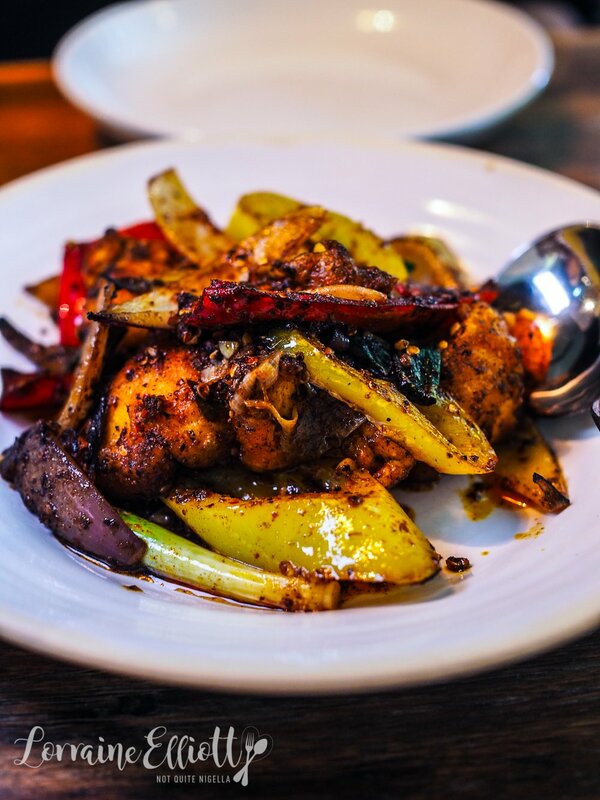 The cuttlefish is coated in a very light turmeric batter and melts in the mouth. This is especially good with the raita and the Seeni Sambol which has an appealing sweetness to it. There is quite a bit of choice and normally I would have gone for the prawn curry or the mutton one but we were recommended the potato curry which they describe as a "white curry". Although there is turmeric listed, it is white in colour and is flavoured with green chill and Lankan mustard. 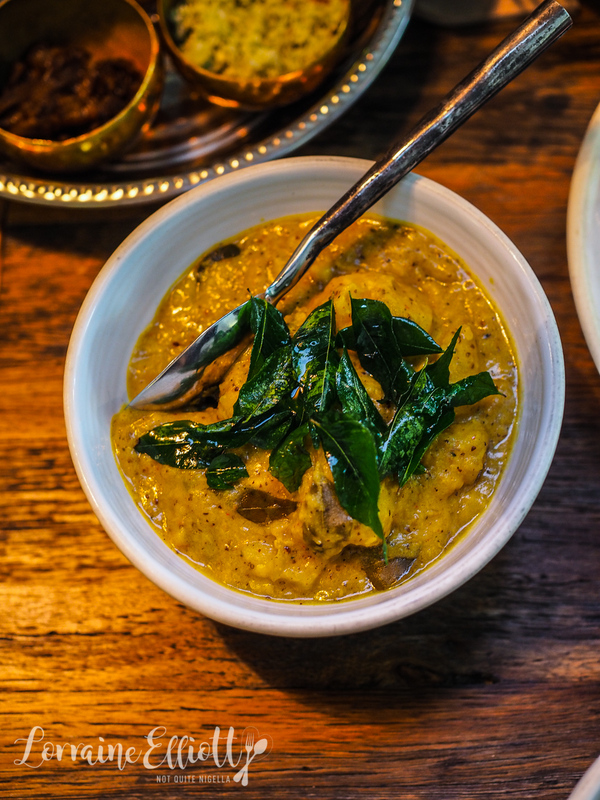 The mustard flavour in this creamy curry is quite strong coming in right at the end but it is quite a mild tasting curry and I wish I had gone with a meat curry instead. 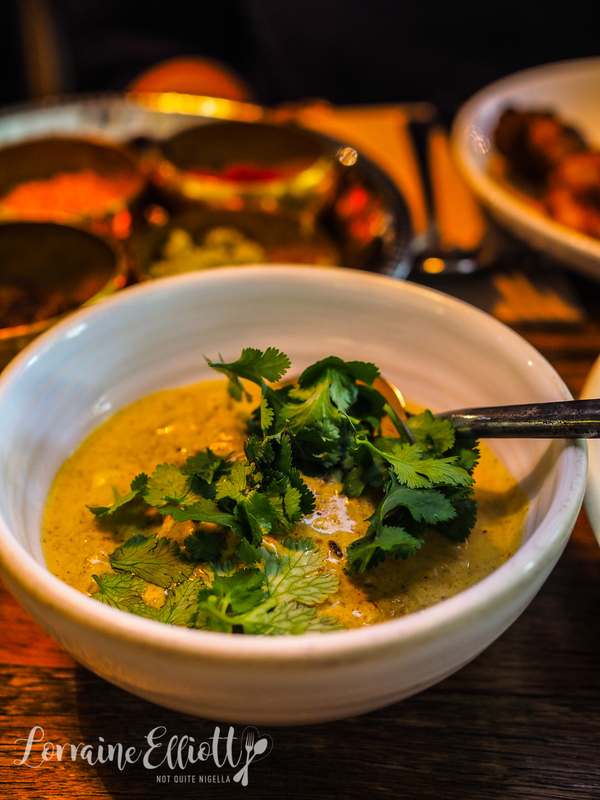 The fish is a line caught ling from Ulladulla, sliced thinly and cooked with a lightly roasted curry powder. It looks not dissimilar to the potato curry but this is much creamier and I prefer this to the potato curry. I love sambols as I like the ability to season a dish to how you like it and I ummed and aahed about the sambol plate because it is quite pricey for seasonings. 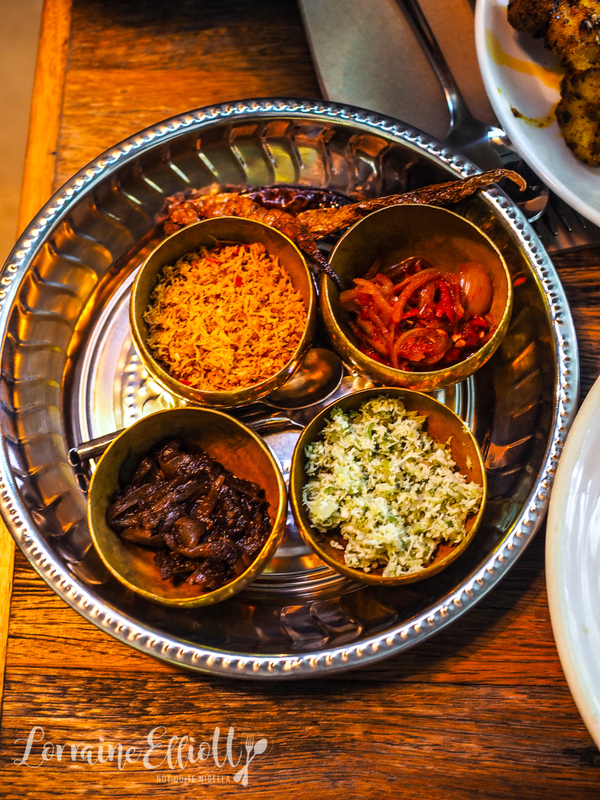 There are four sambols on the mixed plate: a green pol sambol with coconut, ginger and coriander; a hotter pol sambol with coconut, Maldive fish chilli and lime; a seeni sambol which is jaggery sugar caramelised onions with tamarind and a katta sambol with onion, chilli and lime. On the side are some delicious white chillies which are deep fried whey soaked chillies that are crisp and full of flavour-they are a bit on the hot side and Girl Next Door suffers a little after she nibbles on these. 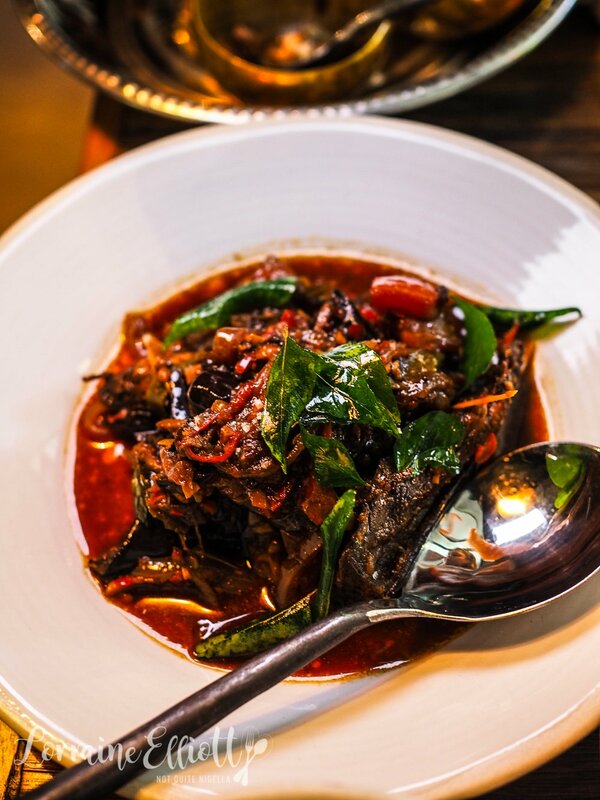 The eggplant dish comes out last and the eggplant is soft and stir fried with plenty of onion, chilli, turmeric, tomato and yellow and black mustard seeds for punch. The reason why Girl Next Door and I get on so well (she used to be a food writer at a magazine and we met on a media trip many years ago) is because we are not shy about ordering a lot. And the dessert menu here has many options. There are 7 options staring us in the face and we really want to eat 4 of them so Girl Next Door says "Well if we have to eat four desserts we have to," with a casual shrug of her shoulders. And so we do. Four desserts, two girls. And our lovely waitress just lets out a "F^(^ yeah!" and we like her even more. 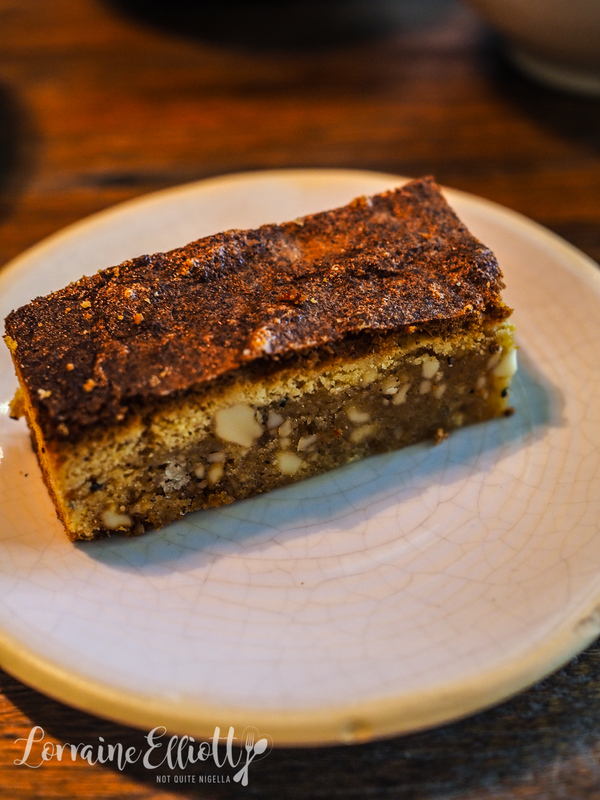 Nan's Love Cake is a bar cake, dense and slightly dry made with cashews, semolina, sweet spices and rose. We both agree that it would be great with a cup of tea or coffee in the afternoon. This was an interesting dessert that really grew on us. The first couple of bites we were really getting used to it-it's a buffalo curd that has a slight graininess to it with palm treacle sauce and crunchy buckwheat for texture. But by the third spoonful Girl Next Door is smitten. 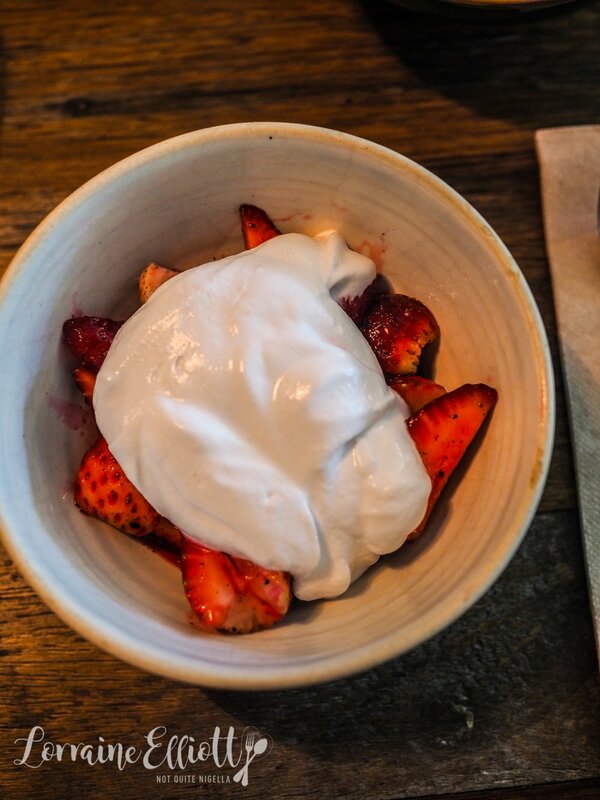 The strawberries and cream have a nice boost of rose syrup and a little ground long black pepper before being covered in a big dollop of whipped coconut cream. It's a nice summertime dessert and I can imagine making something similar for a simple dessert. 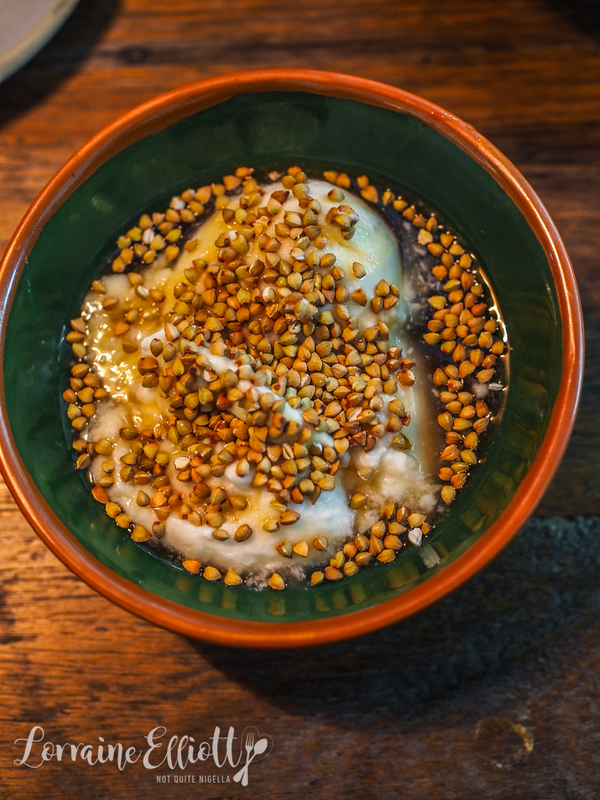 But my favourite dessert is the Watalappam, a baked jaggery custard topped with toffee, cashews and sesame seeds. It's sweet but not overly so and taken back from the brink of it with the burnt toffee shards on top. 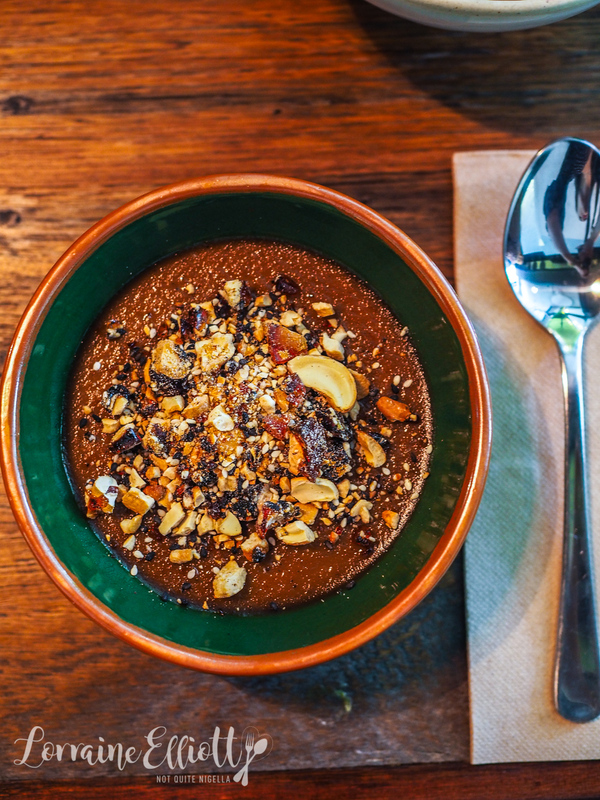 In the end, the bill isn't inexpensive but our dessert gluttony is partly to blame for that. 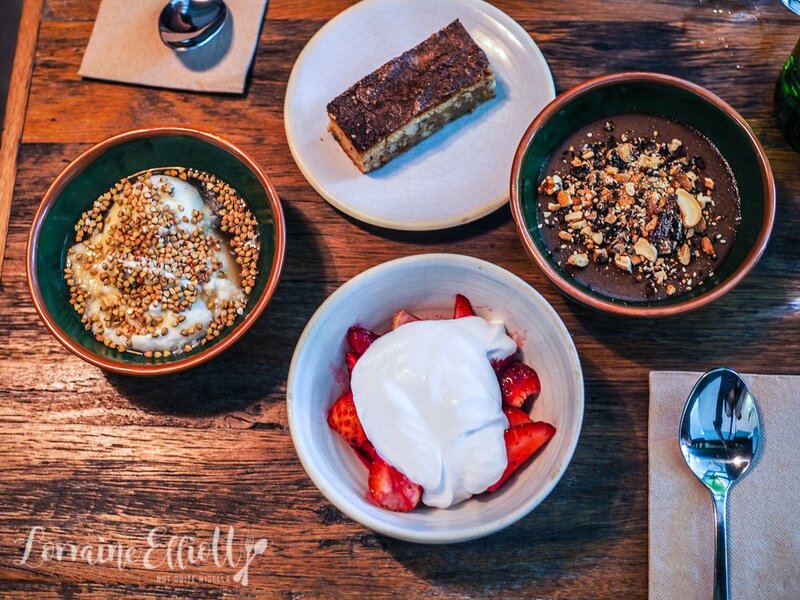 So tell me Dear Reader, do you ever order double the desserts to people? 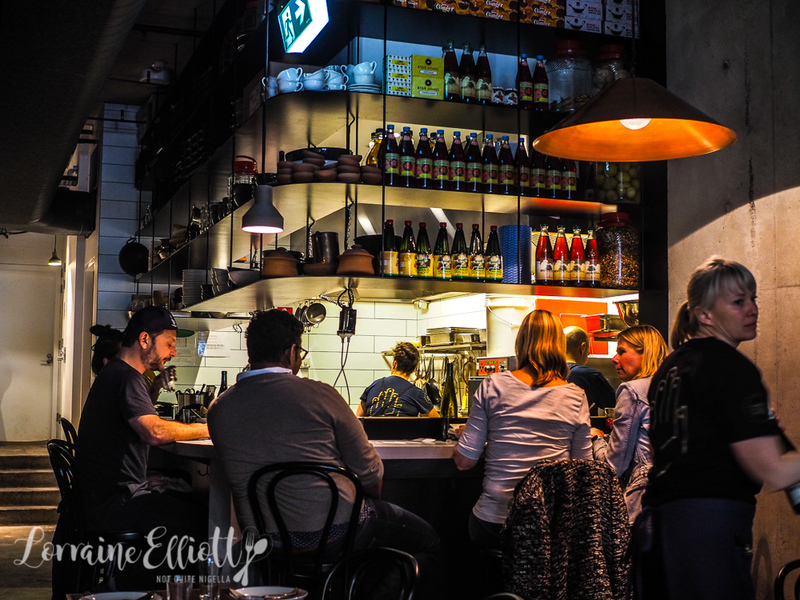 Who are your favourite people to eat out with and why are they your favourite to eat out with? 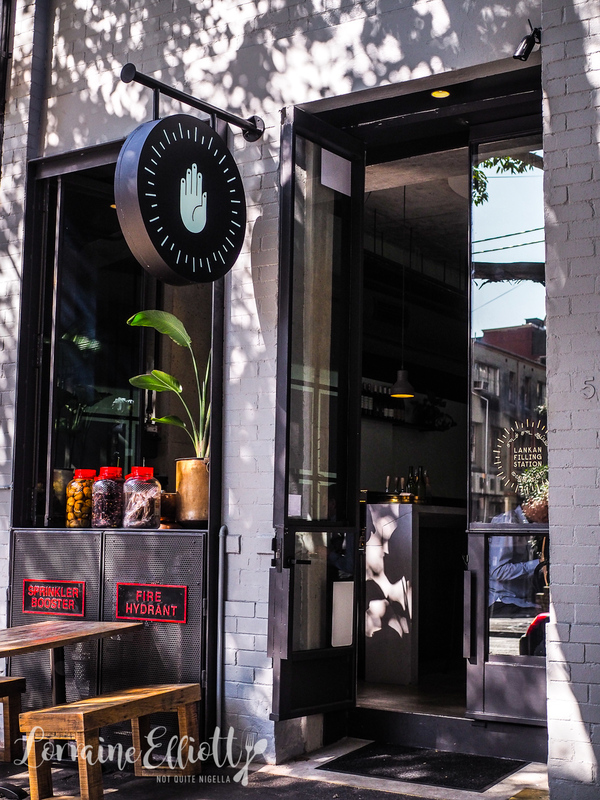 restaurantIt's a Sausage Party, Finding Sydney's Best Hot Dogs!